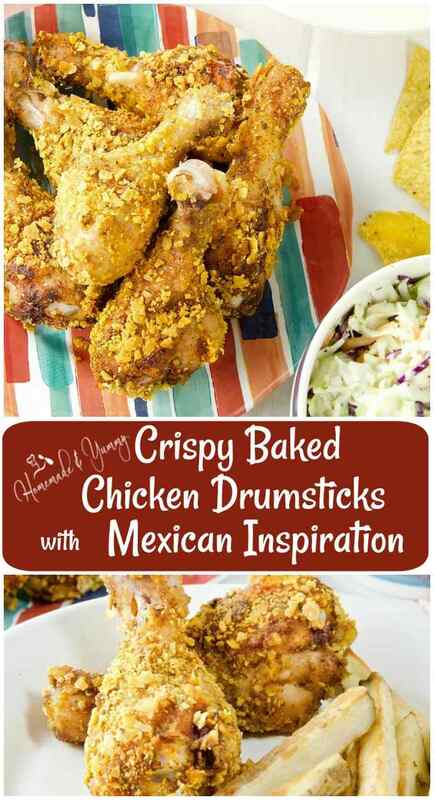 Crispy Baked Chicken Drumsticks Mexican Inspired |Homemade & Yummy Homemade & Yummy | Fun delicious recipes and more. Crispy Baked Chicken Drumsticks with Mexican Inspiration are bursting with flavour. Crushed tortilla chips and Mexican seasoning make these baked chicken drumsticks crispy on the outside, juicy on the inside and finger licking good. Do you prefer crispy baked chicken or crispy fried chicken? I am not a fan of deep fried foods (except for fries). I make crispy fries at home all the time (without all the oil). Now crispy baked chicken is a whole other ball game. This oven fried chicken recipe is going to knock your socks off. So will my Crispy Onion Rings! 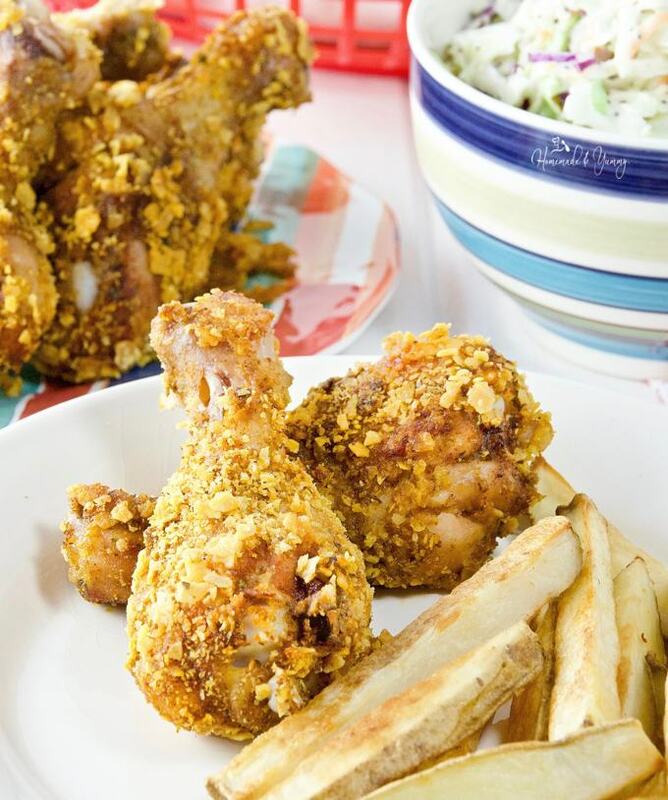 Once you try these Crispy Baked Chicken Drumsticks, you will be hooked. Biting through that crispy tortilla crusted, Mexican seasoned skin to the juicy meat underneath is a party in your mouth. Make lots, the family will be fighting for the last one. All it takes is Mexican seasoning and tortilla chips to make the most delicious crispy chicken you have EVER tasted. The seasoning can be your own homemade blend, or store bought (that’s what I used). If you have taco seasoning, that will work too. I used plain tortilla chips, but feel free to try any variety you like. How cool would blue tortilla chips look here? I have eaten my fair share of KFC in the past but NEVER tried the Double Down. That is way beyond my tolerance for fried foods. I have never tried deep fried ice cream either. 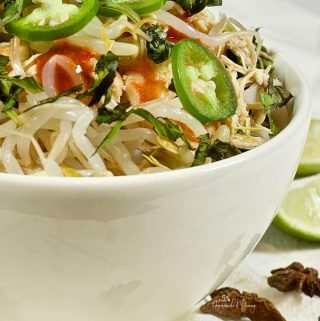 Getting all the crunch and flavour without all the extra fat and calories is my way of cooking. Baking is a great way of getting crispy results, even with things like egg rolls. 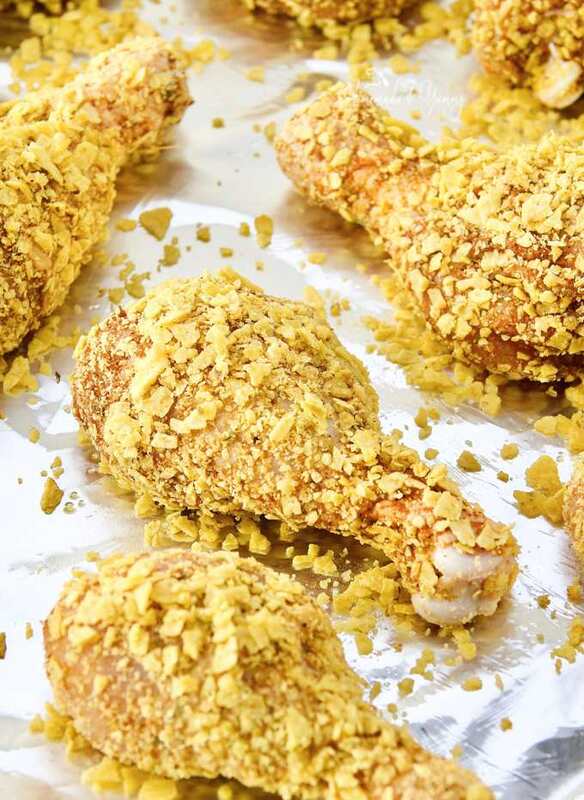 How To Make Crispy Baked Chicken? Put up your hand if you have NEVER made crispy chicken in the oven. Drumsticks in the oven are the BEST! It is so easy, and less messy than frying. All you need are a few ingredients and a well greased foil lined baking sheet. If you wrap the sheet really well you won’t have a lot of cleanup either. Way easier than dealing with all that oil. 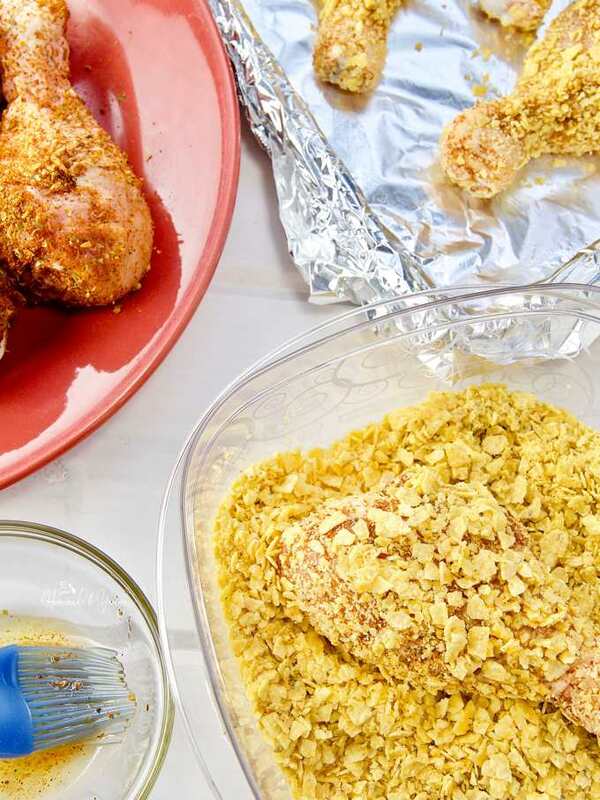 The secret to making crispy baked chicken is the “crumb coating”, and leaving the skin on. Removing the skin still produces tasty results. If you are looking for that crunchy sound and crisp texture, it is all about the skin. Oven fried chicken would not be crispy without the skin. There are several options for the crumb coating. For this crispy chicken recipe, I used crushed tortilla chips. Panko breadcrumbs or crackers are great, and so are cornflakes. Have you ever had cornflake chicken? I remember my mom making that when I was a kid. 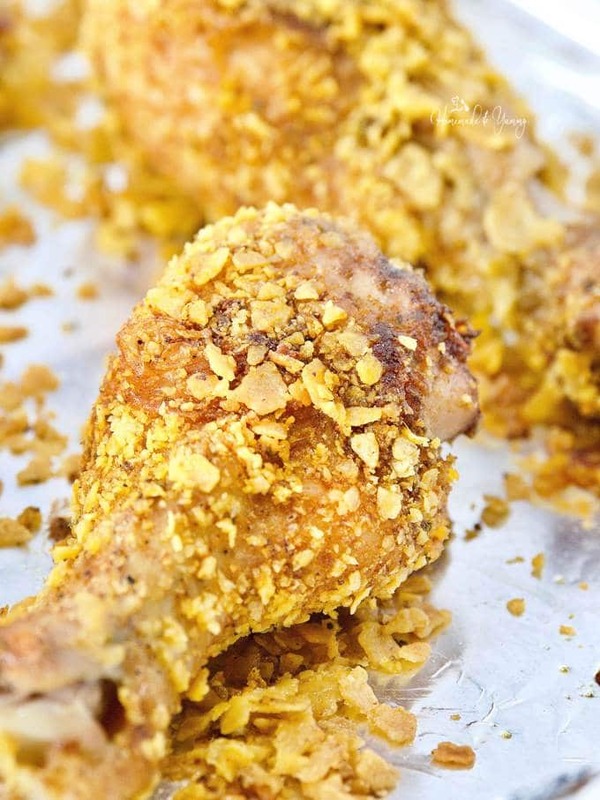 Some baked chicken recipes use the “flour-egg-crumb method” to coat the chicken. My method is way easier, which means less mess and fewer dishes. Wash the drumsticks and pat dry. Place crushed tortilla chips in a large bowl. Generously rub Mexican seasoning on each piece of chicken. One at a time, take a drumstick and brush it with oil and generously coat it with the crushed tortilla chips. Place on a baking sheet and cook until golden brown. How easy is that? While this chicken bakes, the aroma will have you licking your lips in anticipation of the deliciousness that is only a few minutes away. Do you call them chicken drumsticks or chicken legs? I have always called them drumsticks. Seems that I use the drums or the thighs most often. This recipe would work great with any cut you like. I am already anticipating some baking some crispy chicken wings in the very near future. These Crispy Baked Chicken Drumsticks with Mexican Inspiration are a favourite around here. With a couple of sides like fries and coleslaw, takeout doesn’t have a chance in this house. Easy to make, delicious to eat, and I guarantee your family won’t complain if you have leftovers either. Looking for some sides to go with these baked chicken legs? Cucumber Salad with pickled onions would be perfect! What is your favourite crumb coating? I will say crushed tortilla chips work amazingly well. Be sure to sign up for my WEEKLY NEWSLETTER and gram your FREE printable. 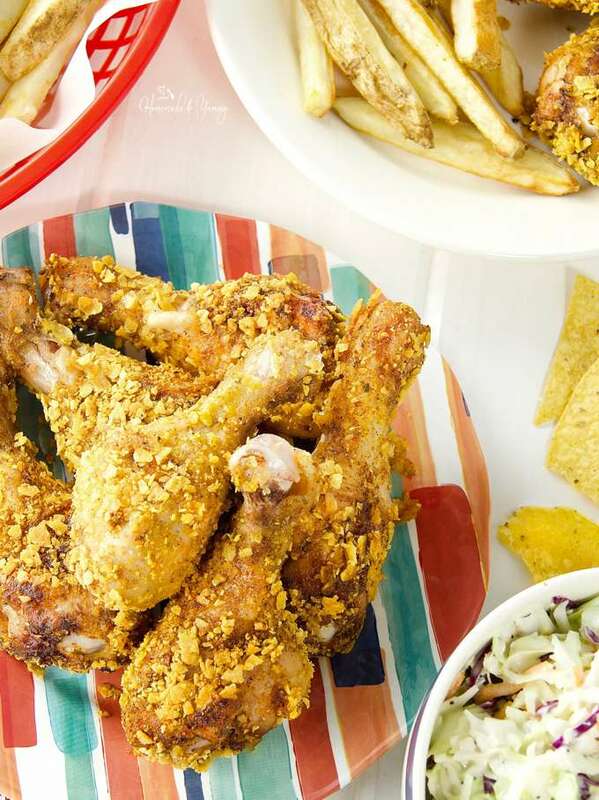 Crispy Baked Chicken Drumsticks with Mexican Inspiration are finger licking good. Tortilla chips and Mexican seasoning combine to make these crispy on the outside, juicy on the inside, and full of flavour. Line baking sheet with foil, and spray with cooking spray. Wash chicken drumsticks and pat dry. Place on a plate. Crush tortilla chips using a food processor. You can also place them in a plastic bag and crush them with your hand. Place the crushed chips in a large bowl. Set aside. Put your oil and Mexican seasoning in bowls and set aside. 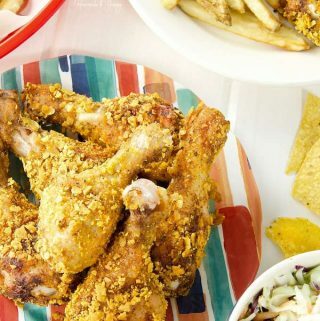 Generously rub each drumstick with the Mexican seasoning, making sure to cover it all over. Place on a plate. Working with one piece of chicken at a time, lightly brush some oil on the drumstick. Place it in the tortilla chips and nicely coat. Place the coated chicken on the baking sheet. Continue this with each piece of chicken. Place the baking sheet into the pre heated oven, and bake until golden brown, and crispy (about 25 minutes), turning 1/2 way through. When cooked, remove from oven. I know, the tortilla chips add such great texture and flavour for sure. 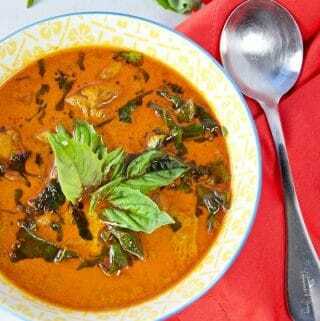 Hope you give this recipe a try. I avoid fried foods too, but love that crunch on a good piece of fried chicken. Genius idea to use tortilla chips as the “crunch factor” and I’d never thought to season the chicken with more than salt and pepper. I’ll bet the kids just run to the table for this dinner! This is by far our favourite chicken recipe. I love the use of tortilla chips!! instant crunch without having to deep fry!!! Here in Australia one of the very famous brand has some limited addition flavours out. My favourite Southern fried chicken flavour. HOW GOOD WOULD THEY BE USED IN YOUR RECIPE?!?!?!!? Oh I bet those would be great for this recipe. This is such a great way to avoid all the fat from frying. Love that you used tortilla chips too. They’ve got such a great crunch and hit of saltiness! Love it! Yes I totally agree. I am not a fan of fried food. This on the other hand…we cannot get enough of. 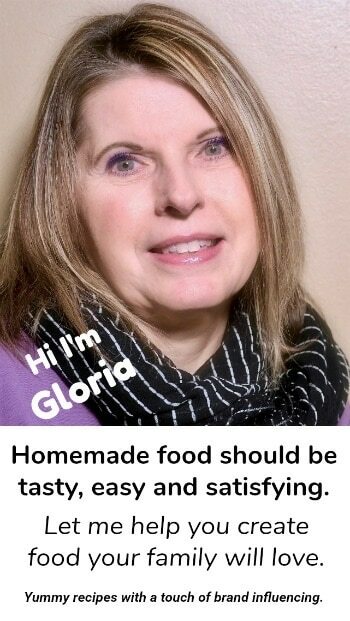 Thanks for stopping by…hope you give this great and easy bread recipe a try. I see how crispy and delicious those drumsticks are through the screen. 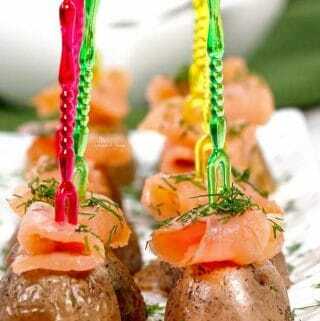 i am always looking for fun recipes for my little kids and happy when i find great ideas. thanks! We I know the big kids here like this too. You’re a genius. I refuse to deep fry anything at home but I love crispy chicken. I would’ve never thought to use tortilla chips! I never would have thought to bread the chicken with tortilla chips! It looks perfectly crisp! 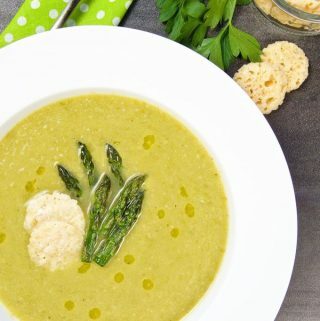 Great recipe, thank you for sharing! These do indeed look so crispy! It’s hard to get that crispy crunch from baking chicken – can’t wait to give this a try and bite in! Yes they are super crunchy….and SUPER delicious. Hope you give them a try. This looks SO amazing!! I just printed this off so I can add it to my weekly menu!! Seriously – this looks SO GOOD!!!! Thank you for posting it! My kids are going to love this one! OMG…this is so good. It is our favourite by far. I know your kids will love it. Okay, I’ve never but tortilla chips on chicken before. This, with the spices is such a good idea. 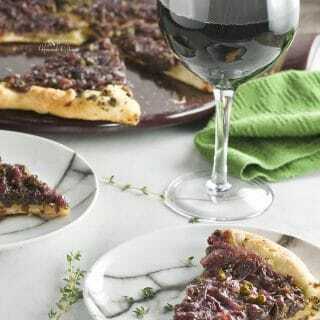 I’m totally going to be giving this recipe a try! We cannot get enough of this chicken. 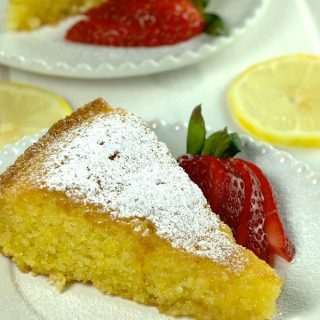 This looks so crispy and delicious! Yum! It certainly is….hope you give it a try. Absolutely loved the idea of baking! Crunchy crispy chicken yumm! This is SOOOOO good. Hope you give it a try. These are definitely not your average chicken drumsticks and I love it! 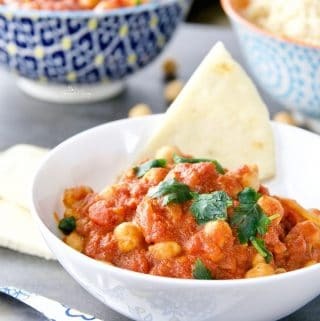 The chips and spice sure make these delicious and perfect for dinner any night of the week. These are our favourite by far. I always wonder how to make them crispy. Now I know how! Such a great idea to use tortilla chips. The tortilla chips work awesome…and so crispy. absolutely love that crunch on top! i prefer to oven bake things when possible and this looks like one of those recipes. This is so crunchy….and so delicious. These look absolutely delicious. 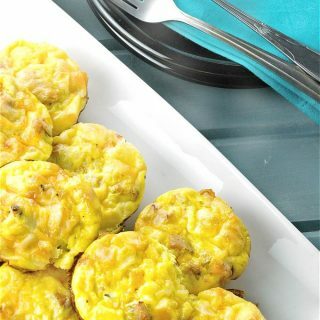 Love the idea of using tortillas for the crunchy coating. The chips work so well. Hope you give this a try. 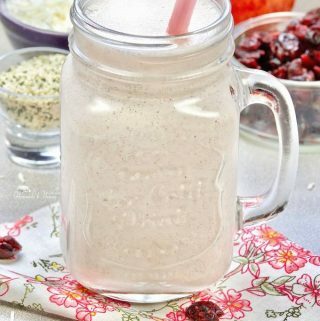 Love a good fakeaway, so much better for your health and wallet than getting fast food in! Love this idea. This is our favourite chicken dish for sure. Economical too. My family loves crunchy drumsticks! The tortilla chip coating sounds fantastic! I need to make these soon. Hop you LOVE them…we sure do. Us BIG kids do too. ENJOY! !